Night had set in by the time the green lights started dancing in the skies. I was in a canvas tent, trying to sleep in the bone‑chilling cold of the late Arctic summer, worried about hungry polar bears. The cries of my fellow travelers roused me and I cursed, pulling on snow pants, boots and a warm jacket before facing the night air. The aurora borealis, or northern lights, were coursing through the black heavens, pulse after pulse of neon green against the scatter of stars, so near it was as if the curtain of light embraced us. They would fade away. We would hold our breath. And then back they would swoop, suffusing the sky. The heavens writhed with the otherworldly green rays, on and on, as if they held sway not just over our planet but over time too. Watching those neon northern lights, I was closer than I knew to some of those who shared my impulse to understand the planet’s magnetic force. My camping spot was on King William Island in the Canadian Arctic, about 100 miles or so from the Boothia Peninsula, where the British explorer James Clark Ross first pinpointed the Earth’s magnetic north pole in 1831. His discovery of it was part of the magnetic crusade, the most sustained and impassioned scientific campaign the world had seen until then. At that time, the might of nations depended on naval prowess and efficient trade on the seas. And that depended on the magnetic compass. There was a trick to seafaring navigation, though. Knowing where you were depended on being able to adjust for the difference between magnetic north, where the compass pointed, and geographical north. The scientific world was united in an obsessive effort to figure out a formula that would allow sailors to know their coordinates more exactly. That required understanding the strange force that pulled the compass. And that demanded information from the top and bottom of the Earth, where the force showed itself most strongly. Watching those neon northern lights, I was closer than I knew to some of those who shared my impulse to understand the planet’s magnetic force. King William Island itself resonates with a grisly piece of the magnetic quest. It is where the British explorer Sir John Franklin vanished in the 1840s along with his 128 men and their two ships. They were trying to complete the Northwest Passage, the quick sea route over the top of North America that would connect the wares of the Orient with the markets of Europe. But Franklin was also a player in the magnetic crusade. The ships in his Arctic adventure, HMS Erebus and HMS Terror, carried enough equipment to set up a state‑of‑the‑art magnetic observatory in the Arctic, one of dozens that were being established all over the world as scientists tried to decode the secrets of the magnet. Franklin himself orchestrated the setting up of a magnetic observatory on the island we now know as Tasmania, off the Australian mainland’s south coast. But when his Arctic ships got stuck in the ice and Franklin died, along with many of his men, the survivors abandoned ship and took to the frozen island in their leather‑soled shoes and navy cloth greatcoats in a bid to walk to safety with the Earth’s magnetic field as their trusted guide. Some resorted to cannibalism. All died. Few of their skeletons have been recovered. It was the worst disaster to hit Arctic exploration. The Inuit who live on King William Island say the sailors’ ghosts haunt the place still. Among the relics recovered from the sailors’ doomed march was a brass pocket compass, currently in the collection of the National Maritime Museum in Greenwich, England. The men were trying to read their magnetic position even in those grim final days. It was their last hope to get home. Franklin, Ross, and other Victorian explorers, stuck for years on end in the Arctic, undoubtedly saw the northern lights. But they could not have known how the compass, the magnetic poles, and the auroras fit together. Today, we know that they are facets of one another. The Earth is a giant magnet with its own two poles, north and south. Stretchy magnetic field lines leave the surface of the Earth at the south magnetic pole; run around the planet, where they interact with the magnetic fields of the sun and the galaxy; and then reenter the Earth at the north magnetic pole in unending, erratic loops. Our magnetic field is generated in the Earth’s most secret inner reaches — its hot, yet frozen, metal inner core surrounded by a liquid metallic outer core. That heat, a remnant of the planet’s violent birth, is the secret to the planet’s magnetic power. The core has been on a multi-billion‑year quest to get rid of that heat from the inside out and is shedding it through convection. Convection generates electrical currents in the molten metal of the part of the core that is not yet solid, and those currents produce a magnetic field. Phoenix‑like, that field is continually being created and destroyed. It stretches out for thousands of miles into space, our planet’s giant defense system against the lethal invisible rays and charged subatomic bits that would otherwise rip through living tissue and tear away the Earth’s atmosphere. Consider that our sister planet, Mars, lost its atmosphere, water, and likely any life forms when its internal magnetic field died billions of years ago. A compass, with its magnetized needle, is responding to the Earth’s magnetic field. And the auroras? To humans, the magnetic field is invisible and imperceptible. We see the effects of the Earth’s field, for example, when a compass needle moves. But many species actually perceive the magnetic field. Some scientists call it a magnetic sixth sense that is like sight or touch, just more poorly understood and more complex. Creatures from bacteria to spiders to squids to sea turtles to almost everything with a backbone somehow use the magnetic field to navigate; it’s one way they find food, mates, homes. Birds, though, are in a class of their own when it comes to perceiving magnetism. One study found that they can just open their eyes and see it, the way we see light. Biologists believe that humans once had the ability to sense the field the way other vertebrates still do. Vestiges of it are knitted into our genetic makeup, albeit dormant. But mostly we walk around unaware of this hidden force field that has such an effect on our lives and our world. The exception is the auroras. They usually appear in great oval rings around the top and bottom of the planet. Occasionally they show up closer to the equator. They are magnetism briefly made visible, the product of violence in outer space perpetrated by plasma that has roared at us from the sun. That plasma, also known as solar wind, has a magnetic field of its own, and when it is directed in a certain way, it can tear open the Earth’s magnetic field. Solar wind rushes in along the loops of the Earth’s magnetic field, pouring fast‑moving, highly energized atomic particles into the polar regions, where they crash into oxygen and nitrogen atoms in the Earth’s upper atmosphere. In turn, the solar wind’s ferocious energy is transmitted to the oxygen and nitrogen atoms, exciting them. As the atoms relax back to normal, they shed their extra energy as light and color. The green northern lights I saw were excited oxygen atoms frolicking in the sky, showcasing the Earth’s own magnetic field. It was like looking into the sky to see a reflection of the machinations of the bowels of our planet. Mostly we walk around unaware of this hidden force field that has such an effect on our lives and our world. For thousands of years, men and women have struggled to understand what magnets mean. They have looked to the heavens, not because they thought the aurora or the celestial bodies could provide clues about magnetism but because they thought that the heavens were the Earth’s puppeteers. If they looked closely enough at the stars, they would be able to read whatever they needed to about our planet. Painstakingly, through experimentation and flashes of inspiration and, finally, math and theoretical physics, they built up the conceptual understanding of magnetism we have today. It is highly abstract. It is ardently creative. It is slightly imperfect. But it is powerful. And revelatory. It tells us the surprising news that we need to pay close attention to what used to be called our planet’s magnetic soul. The Earth’s magnetic power is on the move. That power is eccentric and, therefore, so are its poles. Eventually, the covert intrigues within the Earth will become so violently disruptive that they will force the poles to switch places. We know this because it has happened hun‑ dreds of times in the planet’s history. The last time, 780,000 years ago, our species was not yet on the planet. But the long string of pole flips has left traces buried in the seams of the plates that fashion Earth’s crust and in some of the rocks and lava laid down on top of it. When the poles switch again, the one we call north will move to the south. South will be north. As that happens, the magnetic swaddling that protects our planet will waste away to only about a tenth of its usual vigor. In turn, that will affect each of us and the very fabric of our civilization. 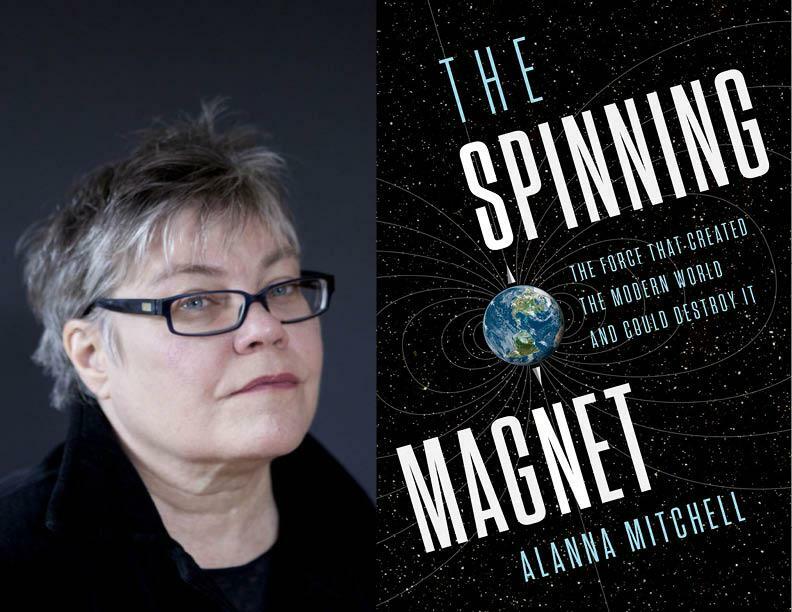 Excerpted from The Spinning Magnet by Alanna Mitchell. Copyright © 2018 by Alanna Mitchell. Published by Viking Canada, a division of Penguin Random House Canada Limited. Reproduced by arrangement with the Publisher. All rights reserved.